Well done to the Shelmalier U10/11 hurling teams who travelled to the Wexford Centre of Excellence in Ferns on Sat last to take part in the all-county blitz. All the boys showed some great skills and determination in all matches and the teams returned home undefeated after a day of extensive hurling. Duffy Rovers paid a visit to Hollymount on Thursday evening last to take on the local side in two matches with all players well catered for in both matches. All the boys displayed the hurling skills they have learned and practiced over recent years and they put it to good use when winning both matches by a narrow margin. There were great crowds in Hollymount on Sunday last when the club hosted the annual under 10 and under 8 blitz in aid of Crumlin Children’s Hospital fund. Great credit is due to all the team selectors both the Shelmaliers and the many visiting teams. To all the club parents and supports who made a great effort to make everybody so welcome to Hollymount on the day. Finally to all the young men who so proudly wore the famous black and amber jerseys on the day, they will be the adult ‘Bold Shelmaliers’ men of the future. It promises to be a great days hurling. The first matches starts at 10am. We would also appreciate any help on the day with car parking, setting up and serving tea & sandwiches and collecting at the gate. If you can help with any of these please let me know (087 2299686) Padraig. U10 Hurling Match v Cushinstown on Friday eve is now at home in HOLLYMOUNT.Pls meet there @ 6:35. 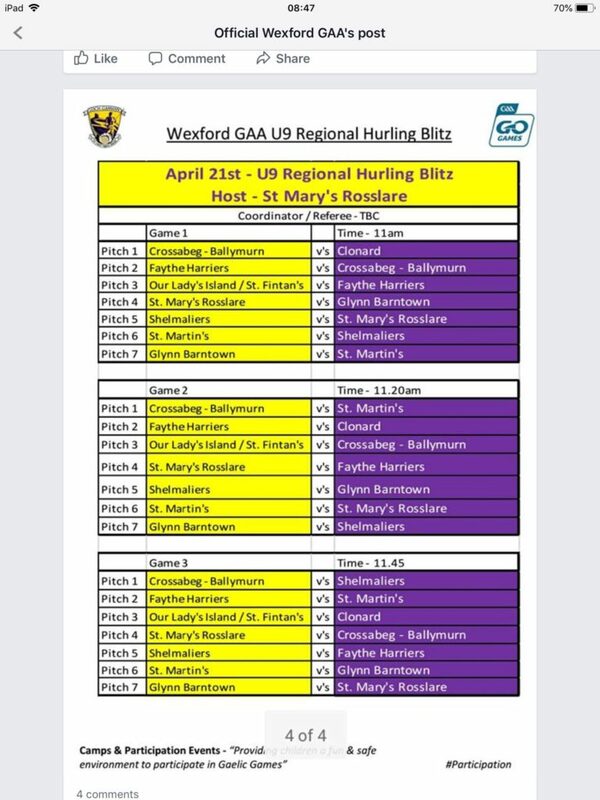 We are also playing a mini blitz in Blackwater on Sun morn. Well done to the 21 U10 boys who played St. Martins in Piercestown friday evening. Despite damp conditions and a tricky crosswind they showed plenty of skill and commendable battling qualities. Thanks to St. Martins for a good, sporting, competitive game. Next up is Hurling on the Quay, Sat 30th May, and football, away to Cushinstown, on Tue 2nd June. Busy! Well done to Cian Doyle, Castlebridge on winning the long puck at the blitz in Hollymount yesterday. Shels U10 Charity Hurling Blitz this Sunday 28th. All proceeds for Joe Redmond ‘Zambia Immersion Project’ Meet 9.45am.